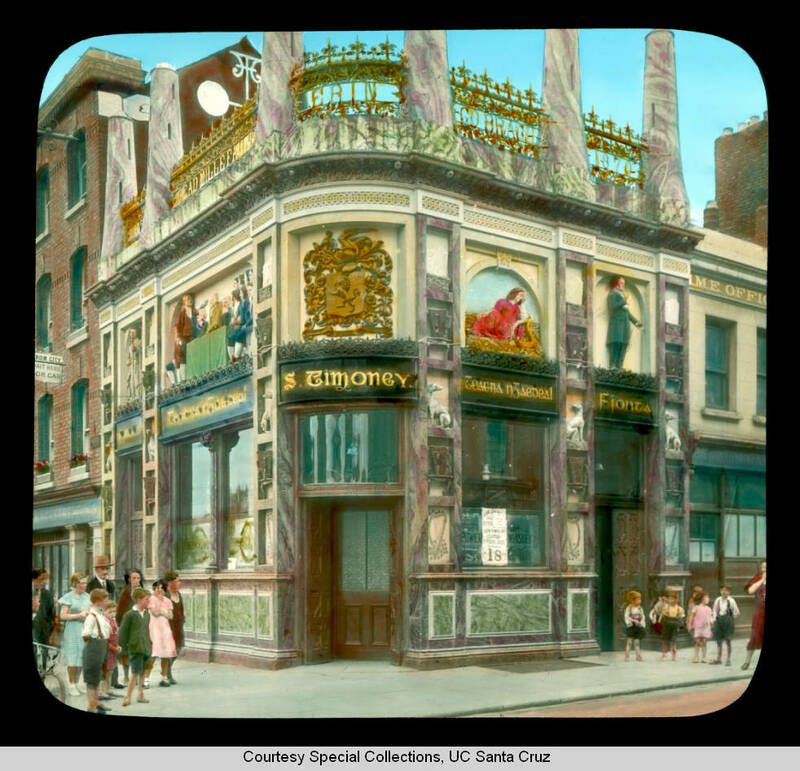 Colourised Slides of Dublin (University of California) | Come Here To Me! 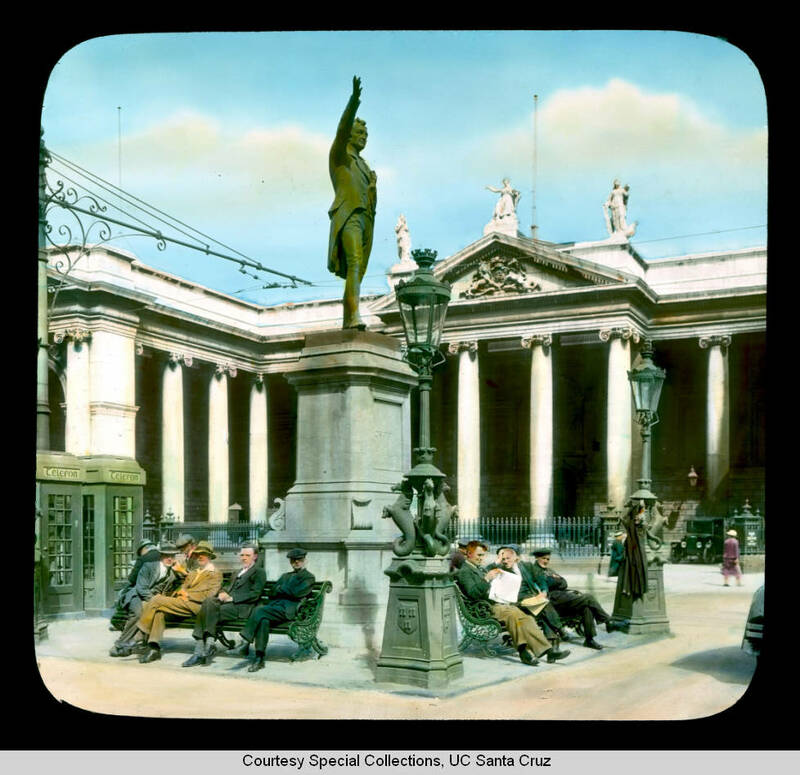 Thanks to Sarah Rose Parsons for bringing our attention to these beautiful colourised slides of Dublin City from the Special Collections at University of California, Santa Cruz. The photographer is unknown but we are told they were taken between 1932 and 1935. Our old friend Henry Grattan is looking well here. The two benches and the telephone boxes are long gone today but the two gas lamp standards, decorated with carved Hippocampus (Sea Horses) still remain. There used to be four but the other two disappeared sometime in the 20th century. For more historic pictures of the statue, check out an old post of ours from January 2010. O’Meara’s public house, known as The Irish House, which sat on the corner of Winetavern Street and Wood Quay from 1870 to 1968 is seen here with a group of relatively well dressed children outside. For more on this pub, have a look at one of our posts from May. This looks like a drayman taking a break from work. 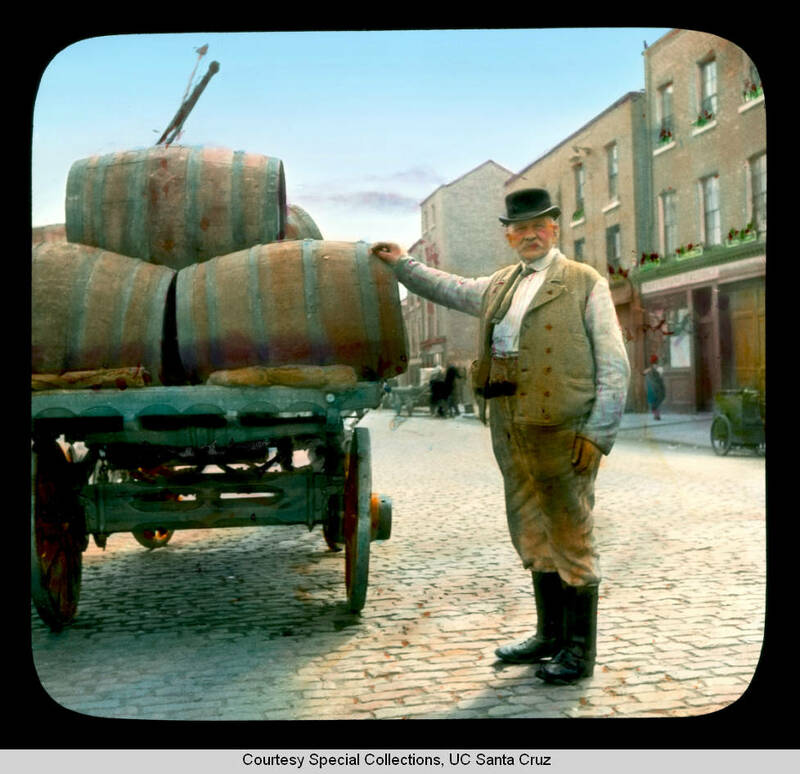 My g-grand uncle was a drayman with Murphys Brewery in Cork in the early 1900s. I read in the book A Bottle of Guinness Please that the arrival of motor transport in the 1930s quickly killed off this occupation. The author David Hughes said that Guinness closed their stables in 1932 apparently. So it’s interesting to see that this chap was still working in the middle years of that decade, possibly with another brewery? Or is he employed in another occupation altogether? View the other 23 slides here at the Retronaut website. In the 1950s the Guinness horse and carts were still coming up Rialto Street onto what was the Grand Canal for their journey to the brewery. They were gorgeous shire-type horses, so they continued some years after 1935 perhaps from leased stables. Can anyone name where all the pictures from the website are taken? Hi dave-p, I think numbers 2 and 3 are the People’s Gardens in the Phoenix Park. No. 6 – 2 black doors – very similar to No. 1 in style, glass panels and balconies. I will take a look at Fitzwilliam? Sq. soon and check them out. The street name is in No. 1 but I cannot zoom in on it. Does anyone know what happened to the memorial in front of Leinster House in No. 5? No.. 20 looks tantalisingly familiar but cannot place the street furniture behind the lady sitting down. Perhaps around Stephen’s Green? 21 – possibly Smithfield or Newmarket?? Don’t the streets look so well without all the modern street clutter i.e. traffic lights, parking meters, traffic signs etc. I can barely make out Merrion St sth or Merrion Sq sth on the sign in the image. Unfortunately a whole row of Georgian houses have been removed since the picture was taken. What gets me about these pictures and a lot of images from way back when is the amount of sunshine! Was there photoshop back then?! The skinny building in the back left behind the women with the canopy with ‘gold’ written on it is Subway. The next shop with the large window on the 2nd floor is the shop with ‘Come and Visit’. The Columns on the next building is what gave it away. Dave-p you are right, it is O’Connell St. I walk down it about 5 times a week, no wonder it looked familiar. But how tacky it now looks compared to then.